Economics of grant writing - FreeEconHelp.com, Learning Economics... Solved! This posting is a little off topic, but I thought it best to vent some of my frustration at the grant writing process. Think of a market equilibrium, where we, the researchers would like to apply for grants. 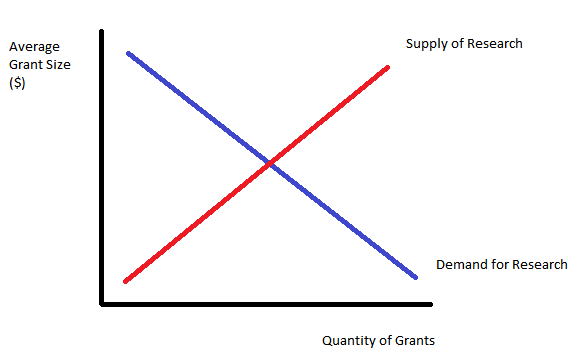 The X axis has quantity of grants, and the Y axis has amount given (in money). We are the supply side, trying to get these grants by supplying our labor. The demand side would be institutions and the government, putting money forward to to get research done. 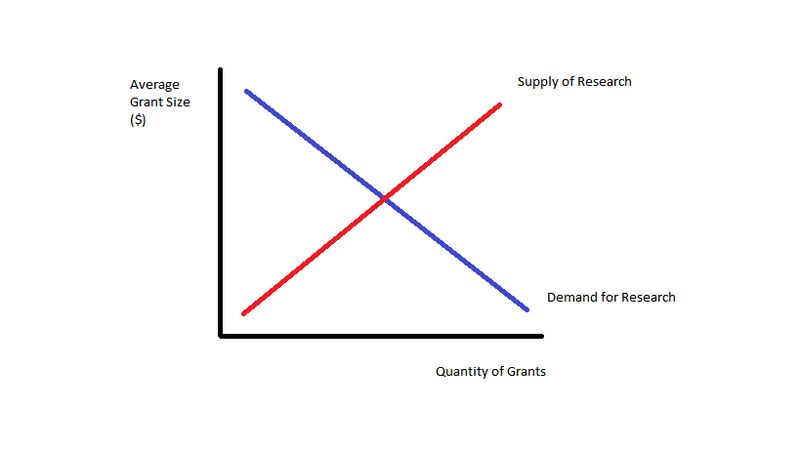 In good times, there is a lot of money on the demand side, which will shift out the demand for research (increasing demand), so that everything else equal we see a larger quantity of grants given as well as larger amounts. In good times, it is also easier to find jobs, and get other sources of funding, so the supply side shifts left, meaning a lower equilibrium quantity, but a greater equilibrium payout. However in bad times, demand for research shifts left (lower amounts of funding), and supply of research shifts right (more academics seeking funding). This results in an ambiguous change in quantity of grants given out, but much less average dollar size for grants. This is especially depressing for those of us trying to get grants as beginning academics. So that is a brief story of why yours truly has been trying to get a sizable grant for almost a year now, and in the end has not landed a big one, but several small ones. That is all demand and supply of the resources from the authorities as http://www.academictranscriptionservices.com/best-tips-for-phd-dissertation-transcription/ has always put a considerable consideration for the betterment of our society because the more we get resources, the more we can have the better results. Get the economics of the grant writing from this zone which is a good thing for you. You can ask a question from this zone with the link of http://www.retype.biz/professional-typing-services/best-resume-typing-service/ which is more good thing for your work. Arrange the best time here and collect the better pattern. Economics of the writing is produced with the support mechanism for the candidates. The identification of the forum and look here in order to become sound for the design of new scheme for the humans. Woohoo!!! Congrats to you! I'm a new reader of your blog. As a new follower of your blog I am gald to know some helpful tips. it is really important to read more to do your hospitality for the international student as they are here like they used to be a guest of us to earn more. This site is very useful for mathematical equations. Our typingservice.org hire latex typist which is useful in making and creating a documents. Our system will be used perfectly to write something informative that you are seeking from your paper.